It’s no longer enough to have a website: if your website isn’t performing, it’s costing you money and not working for you. We share our pick of the five smartest web design trends for 2018, to consider integrating for digital success. Mobile-first sounds like jargon, but it actually talks to the paradigm shift from desktop to mobile web experiences, ecommerce and browsing. This shift has been in motion since the early 2000s, and was accelerated by the release of Google’s mobile-first strategy in 2010. Now, in 2018, more than 88% of Australians own a smartphone and mobile-first is a reality. Is my website fully responsive? Is information, such as my phone number and address, easy to find? Are my social pages integrated? Are my text and buttons the right size for a quality mobile experience? Is my website easy to navigate via a smartphone? Throughout theses stages it’s important to listen to your customers as questions, comments and even complaints can help you to not only understand their preferences, but craft inspiring content that’s both relevant and informative. For more information about mobile first design, read about the 5 Advantages of Mobile Website Optimisation. 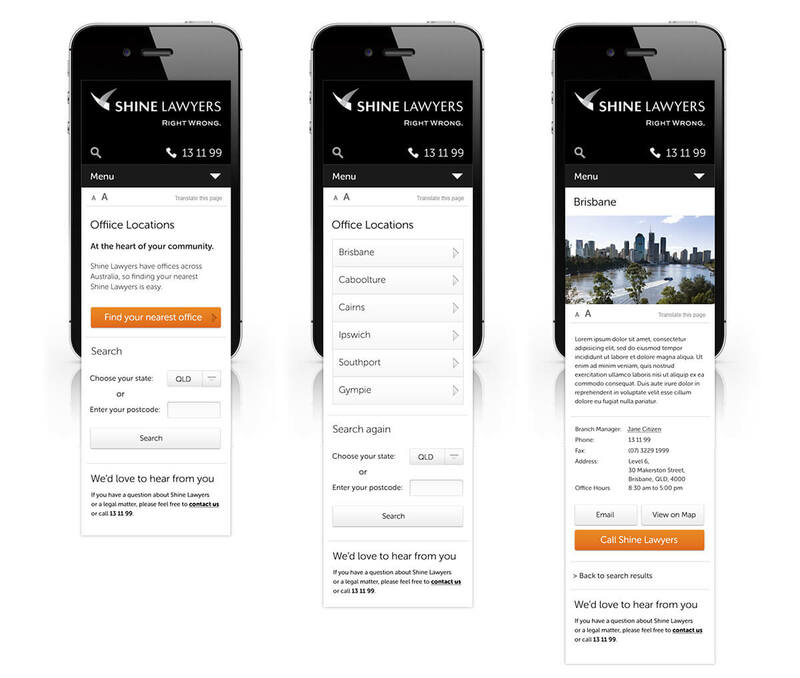 A mobile first approach to the Shine Lawyers Brisbane Web Design. A web design trend we’re loving this year is character-driven typography, that makes a statement and feels unique. The internet is such a cluttered place, and incorporating elements such as creative typography to your website can really help to differentiate you from your competitors. And with content being king, the written word is more important then ever in the design of your website. We also love to see brands use handwritten typography. There is a level of craft that is involved in handwritten typography, that is universally cool and demands respect. Handwritten typography, if done well, feels very special and is entirely ownable. When we think of minimalist design, we think of embracing negative and white space, clean lines, beautiful imagery. We like to call it The Ikea Factor. The Ikea Factor is a serious trend that we’re seeing online this year, with a flush of new minimalist design websites launching every day. We love this trend because not only do minimalist websites ooze craft and professionalism, but they also tend to lend themselves to a smooth mobile experience. In this less instance, less is definitely more. As more and more of us buy smartphones and commit to a mobile-first world, we became far more difficult to engage online. 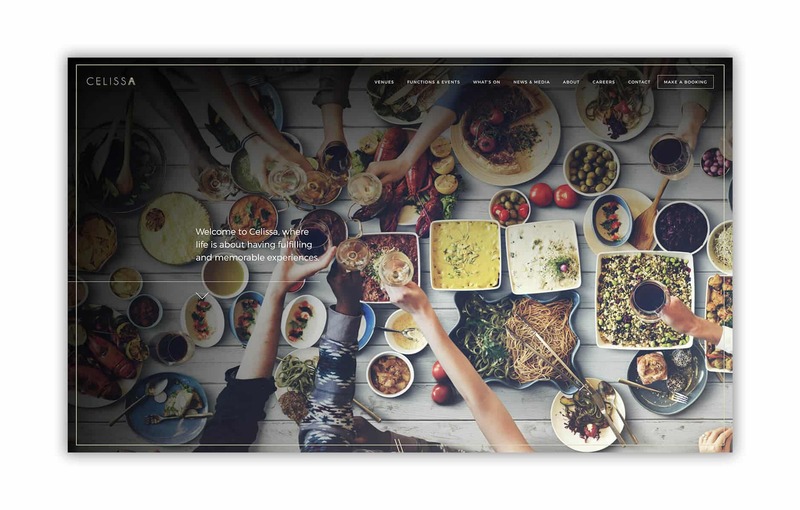 Websites that are built off the back of basic, outdated templates, stand out for all the wrong reasons in 2018. Consumers are not idiots, and a cookie-cutter website may actually do less for your brand, than if you had no online presence at all. One way we’re seeing brands create ownable, engaging online experiences is through the use of illustrations and 3D graphics. Not only do they look fantastic and feel unique to the brand, but they’re also engaging and far more aesthetically pleasing than stock shots or basic product images. We have watched user experience (UX) go from a high-brow design concept, that no one knew anything about, to something that is so mainstream that it is now a consideration with most online builds, especially our own web design process. UX, simply put, is the experience your visitors and customers have on your website. A site that’s easy to navigate on mobile and desktop, is nicely designed and has its content laid out in a logical fashion, likely offers a good UX to its visitors. UX matters because we live in the times of the ‘scroll’. Ever noticed that sometimes you open the social network apps on your phone and scroll mindlessly? How difficult is it to hold your attention? What makes you exit out of a website? What makes you click on a post in your feed? Ask yourself these questions, honestly, and you will understand the value of UX. We’re glad to see this trend becoming institutionalised as a rudimentary basic of web design. Helping you with your web design? Soak Creative is one of Brisbane’s leading creative brand, design and digital marketing agency. We are a nexus of collaboration, innovation and excellence, uniting the best professional minds in Brisbane, under one full service banner. More than just a pretty logo, we build brands that attract your ideal customers, increase your business growth, drive customer engagement, and bring your business to life. Get in touch with us to talk about your a new web design for your company and brand.